A year ago, we had unsuccessfully tested a number of caching plugins on this Azure hosted WordPress blog. Because of ongoing frustrations with slow page loading speed, we tried installing WP Super Cache again – this time to a resounding YES! IT WORKS! While more work is still needed, the page load speed has dropped from 5.8 sec to 3.0 sec with the basic plugin install. WP Super Cache Setup – Quick and Easy! Install the plugin > Easy tab > Caching On That’s all that’s needed to get started! Check that the plugin is working > Test Cache The green text means go! This website is built exactly the same as the Page-Centric Private Wiki outlined in an earlier post, but with some additional changes to the UI functionality. Follow all the directions from Page-Centric Private Wiki adding in the additional functionality outlined here. This is a read-only private website, with all registered users having the Subscriber role. Each registered Subscriber has access to all the pages on the website but does not have access to the WP Default Tool Bar and their WP Profile page. All Subscribers are registered by the website Administrator and given strong passwords that they are encouraged to change on their first login. We don’t work with MySql, but having direct access to the MySQL database is helpful if your admin login became corrupted and you were unable to connect to the website! In the phpMyadmin interface, it is a quick fix to add a new admin user to the database and then login to the website again. Lockout averted! WordPress was created in 2003 as a simple platform for quickly creating a blog, using dated posts in categories. The WordPress platform is optimized for blog posts. Let’s look now at the general and specific steps for setting up a basic WordPress public Technical Blog. A new WordPress blog site (hosted on Azure PaaS) had become bloated with images uploaded directly to the website’s Media Library after only 20 posts. WordPress automatically adds in 3 versions (various resolutions and a thumbnail) of each image, as do some themes and plugins, so the wp-contents/uploads folder was overloaded by at least 400%! When we needed to move the website to a different location & subscription, the native WordPress ‘Export/Import Contents’ did not work reliably enough for such a large number and size of image files. A website Restore operation doubled the size of the websites next backup. Initially we tried using various WordPress plugins to clean up the bloated mess before doing the website migration, but that didn’t get us far – and caused more problems. Convert the WordPress website to using cloud based storage slimming down and speeding up the website. In this case, we migrated the existing images videos and other website uploads to an Azure Blob Storage container. 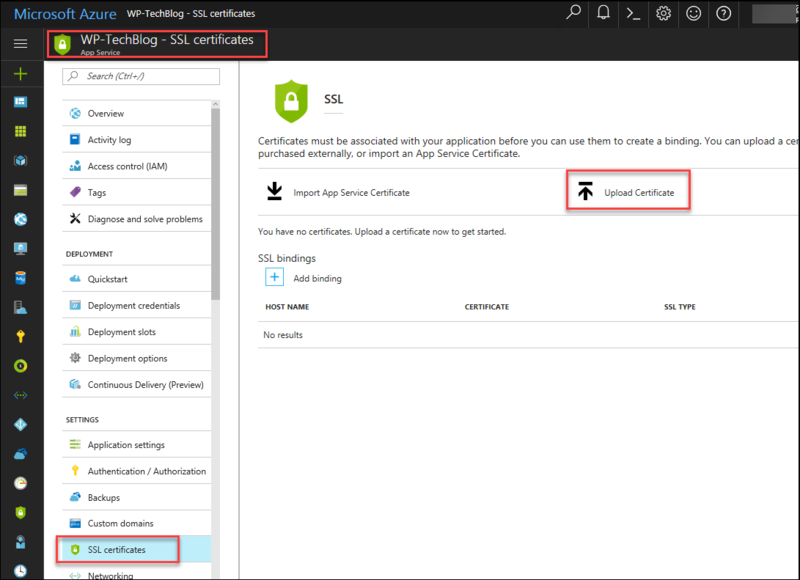 Azure portal Website Settings > SSL Certificates > Upload Certificate > Upload We already have a purchased wildcard SSL certificate on a local drive in .pfx format, that is ready to upload. 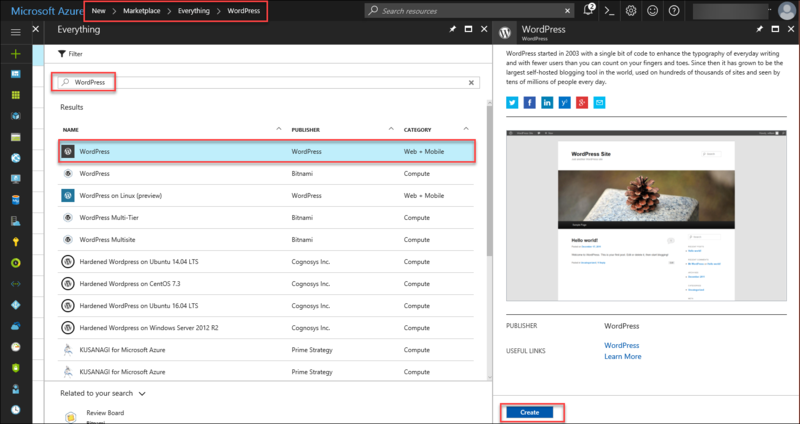 In the Overview blade, the URL of the new azure hosted WordPress website is http://wp-techblog.azurewebsites.net. 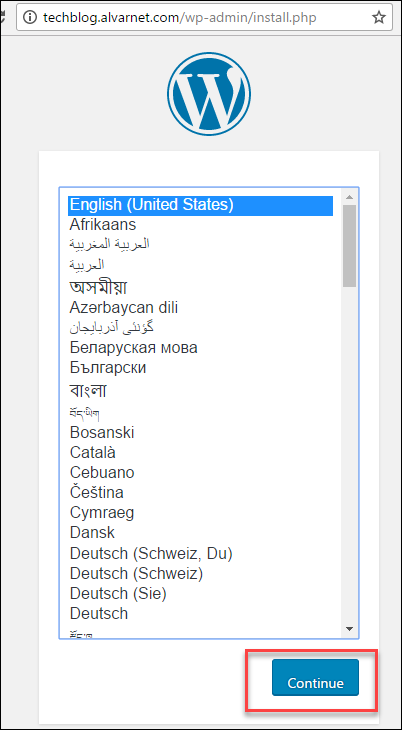 Now we’ll add a custom domain so that the website will resolve to: http://techblog.alvarnet.com instead of using the azurewebsites.net domain. To get started, you will need an Azure subscription associated with a Microsoft account. Learn how to do that here. 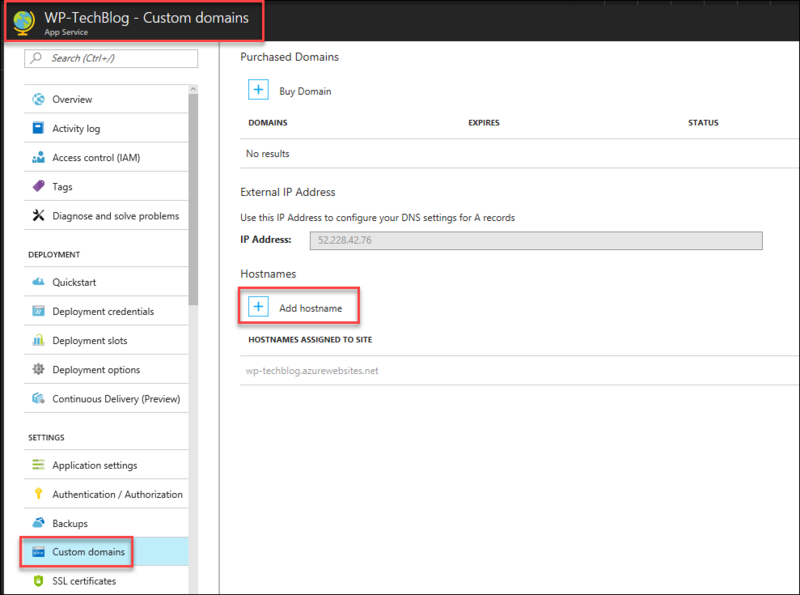 The introduction post in our series on Creating Azure (hosted) WordPress Websites without knowing php or MySql! Do you need to set up a blog, quickly and cost effectively? Do you need to build a private ‘page-centric’ wiki or a public support site? Are you not conversant in PHP or MySQL or the security vulnerabilities of an ‘out-of-the-box’ WordPress website? Are you looking into new WordPress cloud hosting options? We’ve found the answers for you! Microsoft Azure provides a powerful, secure, reliable, scalable, highly-available, pay-for-what you-use, cost effective cloud platform to build and deploy enterprise-grade WordPress websites with Azure Backup and Azure Blob Storage services. You can have a WordPress website up and running in just a few minutes. While setting up the WordPress installation on Azure is straight forward, guidance for building out the rest of a functional WordPress website setup is less structured and not clearly documented for those of us not familiar with WordPress, Php and MySql development. There IS an almost overwhelming amount of WordPress configuration information available online, but it takes a lot of time to sift through even one topic to find what will work optimally for what you are trying to build.